This sparkling cruise ship is the perfect choice for year-round cruises from the east coast of the USA. Sail to the Bahamas & Florida, the Caribbean, or up the coast of Canada & New England. Tons of dining choices and Freestyle Cruising, Norwegian Gem cruises have it all. Chill out by the pool, get lucky in the casino, unwind at the spa, and make the kids happy with Wii games and lots more. Accommodations range from the luxurious multi-room or romantic suites to spacious and affordable staterooms. Norwegian Free at Sea Offer! Book an oceanview cabin or higher on select Norwegian Gem cruises and pick three Free at Sea inclusions* or book an inside cabin and pick one Free at Sea inclusion*. Plus pay just $10pp deposits on sailings departing after 15 April 2019*. Looking for something different? 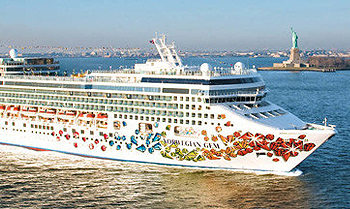 View a selection of Norwegian cruise deals, or view more options for Norwegian Cruise Line. Please note: All Norwegian Cruise Line departures within the next 30 days are not currently bookable online. To make a booking, view all scheduled last minute Norwegian Gem sailings and then call us on 13 13 03 or request a callback during business hours and a member of our team will be to assist with pricing, availability and to make a booking. We apologise for any inconvenience. Stroll through Norwegian Gem’s Art Gallery of original works for sale by a wide range of well-known artists. Norwegian Gem’s meeting room area features various individual rooms. They can be used together or separately. The kid’s pool is just right for pint-size splashing, playing and paddling. The pool also has additional fun features. The Gem Bar is located in Norwegian Gem’s casino which features a circus theme reflecting bold and brash colors of traditional traveling circuses at the turn of the century. Inspired by the Art Nouveau era using Charles Rennie Mackintosh’s design elements and colors. Art Deco inspired with a large screen behind the bar depicting James Bond inspired graphic silhouettes of funky images from the 60’s & 70’s. It’s showtime! And we’ve got a really big show for you at the Stardust. Enjoy Broadway and Vegas-style shows. Balancing classic favorites with the hottest new dishes, Magenta is a can’t miss culinary experience. With daily changing menus offering even more variety and Chef’s Signature Dishes featuring deliciously fresh ingredients, there’s always something to look forward to inside this Main Dining Room. A first class tribute to pop country showcasing songs from the genre’s biggest superstars including Taylor Swift, Carrie Underwood, Luke Bryan, Florida Georgia Line, Shania Twain, Jason Aldean, Miranda Lambert and many others. This dazzling full scale production show blends eye popping music video visuals, hot vocals and innovative choreography into an evening that is part rock concert and all fun. From tear-your-heart-out country ballads to barn burning up tempo hits, this show is sure to get you fired up and your boots blazing! A dazzling display of some of the best music and dance styles from the swing era of jazz (1930s1940s) while showcasing the exhilarating songs of many well-known artists like Duke Ellington, William “Count” Basie, and Benny Goodman. Chicago’s legendary comedy theatre, The Second City, celebrates its 50th Anniversary aboard Norwegian Epic with a hilarious revue of sketches, songs and improvisation. Watch the brightest young comic talent in North America puts its comic spin on current events and life on the cruise ship.